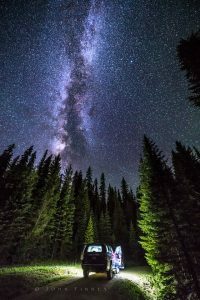 The last day of the tour saw us heading towards Denver in readiness for flights home the next day but with the Moon phase still on our side a few people took the chance to head into the Rockies for some overnight Milky Way and Astro photography and they were not sorry they did. We went up to the Continental Divide at 11,500ft in the Rockies and watched wildlife like Moose and Coyotes and Racoons freely going about their business whilst stopping for stunning Milky Way pictures under crystal clear skies. A great way to end a stunning photography trip in our beloved Colorado! 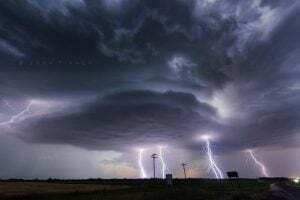 We chased this storm all the way into Kansas where it weakened but by this time more Supercells were forming along the boundary so the 2nd part of the chase was now on. We allowed a developing storm to hit us at Tribune (Ks) and we took some half dollar sized hail. 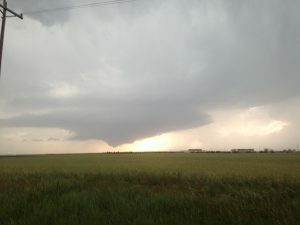 We blasted east from there towards Leoti and Scott City and watched more Supercells quickly form, we raced east to Dighton and let them once again impact the town. The light was quickly fading now but Chase 2017 had one last hoorah and a Cg strike hit the towns generator making everything go pitch black. 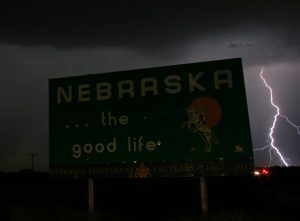 It really was amazing to watch the non stop strobe lightning lighting up the town with no street lights anywhere. 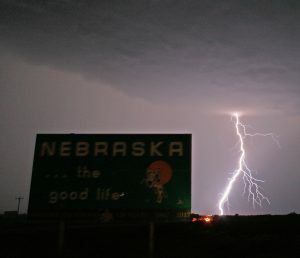 We ended the day at Garden City and along the way the guests snapped away at Lightning from the storm moving away to our east. Started today in Hays (KS) with a firm target of the Nebraska and Kansas Border area from 6pm onwards so we headed north and ate lunch at Alma (NE) Storms today would struggle initially but with the approach of a shortwave trough in the area by 6pm things should get more organised as the day went on and Supercells would be likely by the end of the day. The Tornado Risk once again was very low with less than 2% likely once again due to the insane forecasted temperatures in the 100’s. After lunch we went west to Norton and then north to Beaver City to watch some non severe storms and mainly play with the small hail. Things started to come together around 6pm with our first severe warned storm throwing out 2″ Hail. 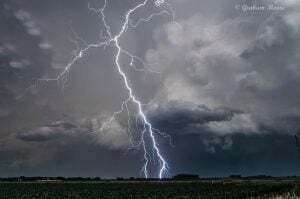 We chased for about 2 hours getting some lovely lightning pictures with a prolific Cg producer, Temps had hit 107f today such was the electrically charged atmosphere. As sunset approached we dropped south to sit just north of Alma and positioned ourselves so we had 360 degree views of Lightning, with the setting sun it made for some amazing lightning pictures. 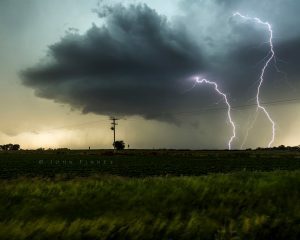 The Storm furthest to our South West in the picture above would give us a few more hours of fun though as it turned into a beautiful LP Supercell which moved straight south out of Kansas and into Nebraska. The lightning on this storm was very reminiscent of the 16th June storm throwing out huge amount of clear air Cg bolts at regular intervals. I even managed to get the Border sign in a few of them. We went further south and John Finney pulled off this stunning image of the LP Structure. 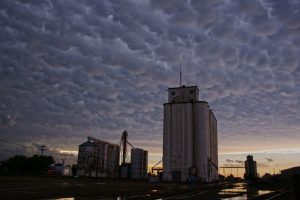 After this we watched a few more storms but was concious of not being drawn too far south as wanted to be in Nebraska for tomorrow (Just for a change) We took some arty farty shots of the Mammatus at Scott City before heading to Hays for the night. Sunday was a down day so we watched some baseball before heading out towards Hays. 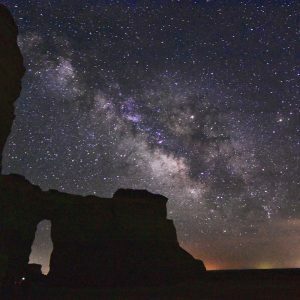 The next days journey was even shorter from Hays to Colby to be near Monument Rocks for some Milky Way action. When the weather goes quiet for a few days we will always try our hand at some Astro Photography if the Moon phase is on our side which today it was. 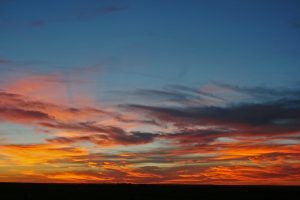 The first picture we got was from the stunning sunset in Western Kansas before we took our positions up at Monument Rocks. Temperatures once again nearing 100f at Salina with mid 60’s dewpoints were the only mitigating factor against stronger tornadoes, decent 40knt NW flow would once again promote SE Storm Motions, A cold front was to our west near Salina so the thing we were hoping for was a storm to initiate in this region and latch onto and ingest the Outflow Boundary. At about 4pm massive Towering Cumulus was getting more agitated and with 4000j of Cape things would be quite explosive today. And soon after 5pm we were chasing with a nice little Storm just east of Salina gaining 50,000ft in 25 minutes. 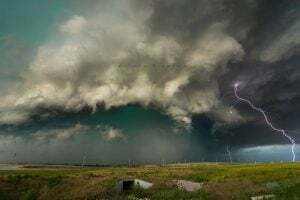 We headed south and got our first look at a rapidly developing Supercell, the speed at which this went from LP to Classic was mind blowing, we literally went 10 miles down the road and it had transformed itself into the picture below with really fast rotation. Now I have seen this type of structure and fast rotation many times before and I even stated to the guests it was only a matter of time before this tried to put a tornado down, it had clearly hit the Outflow Boundary and was really trying hard to produce a tornado, the radar sequence was amazing to see as well with the OFB being eaten up as the storm progressed South East. Our road options to keep south took us South West for about 3 miles and through the town of White City, so we would have to slice right through the hook region of the storm, this can be a risky situation but when the RFB( Rain Free Base) is easy to see there is a lot less risk about it. 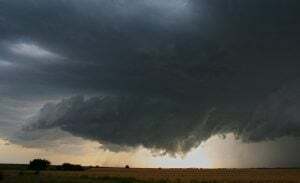 As we went underneath and through the hook the rotation above the road was the fastest we had seen and the storm tried to put down a ghostly white tornado on the road in front of us, and still this storm was NOT Tornado Warned! 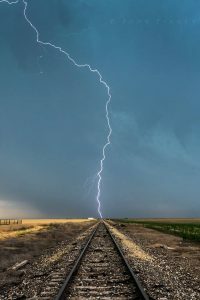 We later learned from Australian Chasers Jane Oneill that this did indeed touch down just to our east as they were 5 miles further east and there picture matches up with where we were! 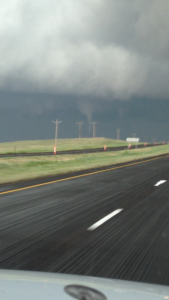 Success the first Tornado of Tour 4 in a lean period! We continued with this storm but as with most outlooks this year the storm grew upscale with other storms around it into an eastward moving system quite quickly! 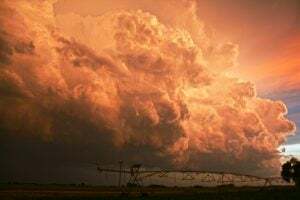 We continued south watching numerous storms initiate to the west and at the end of the day tried to get a direct impact near Emporia but the storm split and went around us, typical once again when you look for some fun core punches things never seen to go your way. Finished the day in Wichita and knowing there would be a down day tomorrow made plans to visit our Kansas Friends and watch a baseball match on Sunday before heading to Colby for the evening in readiness for some Astro Photography on Sunday Night! 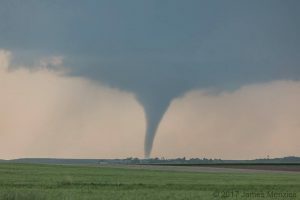 We awoke today in Salina and there was an Enhanced Risk over most of the Eastern half of Nebraska, it was 3 years to the day that the devastating EF4 twin Tornadoes hit the towns of Pilger and Wisner and that looked today where the best risk was. After a lunch in York we hung around for a bit and 3 storms had initiated further north near to the SD/NE Border, once again todays storm direction would be SE under North-West flow aloft. Temperatures once again were into the 100’s and dewpoints in the mid 60’s so the tornado outlook again was at 2%. 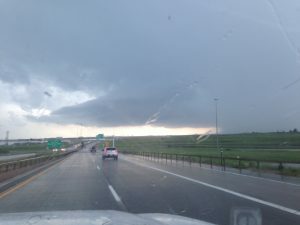 After some deliberating (Probably for too long) we set off northbound towards Columbus, the now 3 semi-discrete supercells were Tornado warned and we could see the updraughts which looked very healthy. After passing through Columbus the western most of the storms looked very nice with a Classic Supercell appearance, the middle one over Pilger looked very HP in comparison but the couplet was worrying with 128knts gate to gate shear! 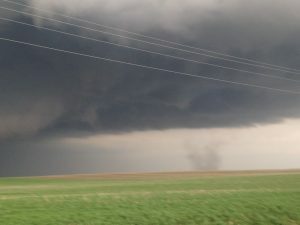 Around this time embedded spin ups were reported near Stanton but we could not confirm this from our position as they were buried in the rain. We backed off south a bit and just North West of Columbus we took a very close Cg lightning bolt that nearly wiped the whole party out, we then retreated towards the town of Monroe, the storm still strengthening then bombarded us with Baseball sized hail, I am not a fan of South moving storms but we chase what we get dealt I suppose! 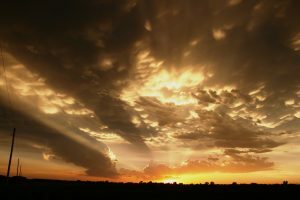 My attention once again was thrown to a stunning LP Supercell to my south which looked majestic in the dwindling light. Tornado chances still looked low and LP Supercells are normally hard to get tornadoes from but always look amazing structure wise, around 8pm I was stunned when I looked on the SPC page and saw an Upgrade to Moderate Risk at this time and an upgrade to 5% on the Tornado chances in SE Nebraska (Possibly all was not lost) We continued south across Interstate 80 to the town of Exeter and then watched just north of the Initiation point at sunset. 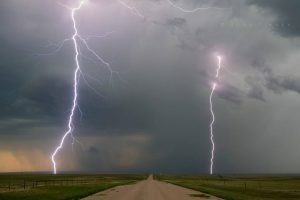 This was to be an amazing spot to be in for the next few hours, we must have counted thousands of Cg bolts raining down to our south, south-west and south east under rock hard cumulonimbus towers! We did not bother to chase any of these storms as it was now dark and people were just enjoying the free fireworks display! If you opened your shutter for 10 seconds you would have about 6 Cg’s in the shot, it really was that easy. 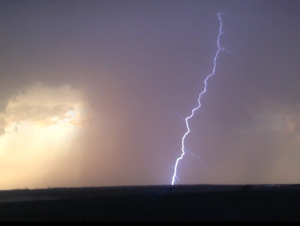 Have included some shots from John and Graham underneath of just a few of the Cg bolts from tonight. 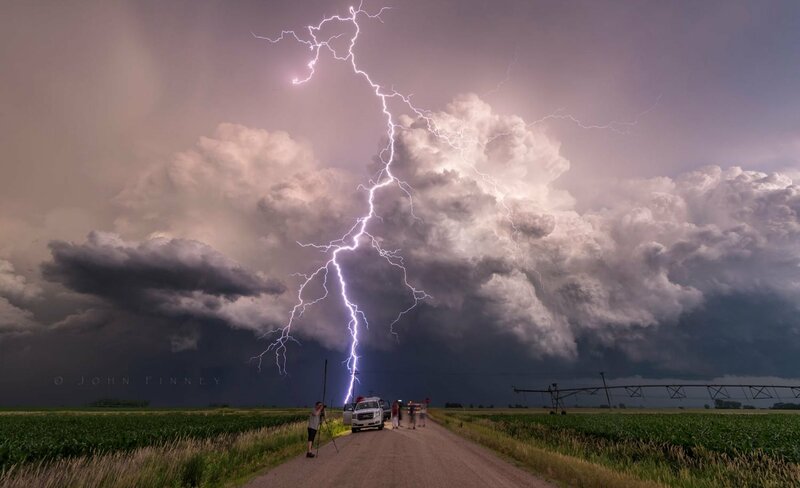 Today is proof that Storm Chasing is not just about Tornadoes but given some amazing photographic opportunities people are just as happy to watch the free light show in front of them over chasing grungy tornadic storms. A really really enjoyable chase day. We awoke in Independence to a Moderate Risk of Storms in Kansas today but not for tornadoes, that risk was 2% with a 45% Wind Damage threat and 30% for Large Hail. 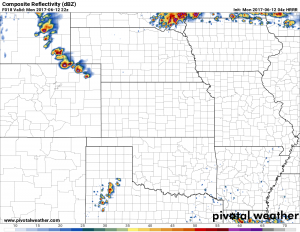 Thinking was Supercells would initiate along a stationery boundary near Hays and then increase in numbers and congeal into a damaging SE moving wind threat overnight. The first storm we got onto just west of Great Bend was nice on its approach but numerous storms going up around it had already pulled this into a fast south eastward moving bow type structure, was today over already ? Surely not at 4pm ? We went south from Great Bend towards Pratt and sat watching developing storms to the west and one such storm really took off for us around 5pm, rapid developments and increasing Cg lightning was noted and then the structure started to take shape with a stunning LP Supercell in front of us, things change so quickly in Tornado Alley from nothing at 5pm to full blown Supercell by 525pm! 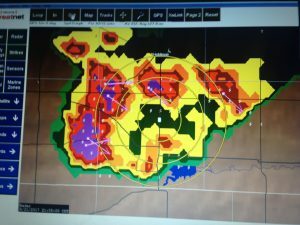 We followed this storm south towards Pratt and then noticed some huge hailstorms coming up from North Central Oklahoma were on a collision course with our storm and us as well. The inflection point looked to be just east of Pratt so I stopped us just near where that point was and we got some great shots of the structure which was jaw dropping with green skies and Cg lightning and pretty rapid rotation. Shortly after the above pictures all the storms came together as one big bowing system heading south east so the final plan of the day was for some cloud art, knowing we had about 30 minutes to get to our destination before the 5-10 minutes of stunning colours took hold we headed north towards Mcpherson to be in the dry just North West of the storm complex to watch the amazing Mammatus and Cg lightning with the sun setting to our west, we were not disappointed what an end to a great chase day! After the eventful day on the 12th with all the guests in at Denver a day early it was bonus chase time but an early and long day on the cards for the start of Tour 4. 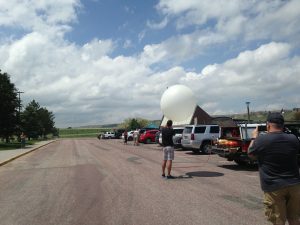 We left Fort Morgan and headed to the base hotel at DIA and then straight back the way we came along I76 a quick lunch and onwards along I80 eastbound to Grand Island. 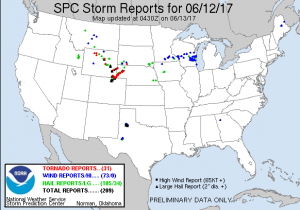 The risk today was across most of Nebraska in the form of a Cold Front across the North and west of Nebraska and further east along an outflow boundary. 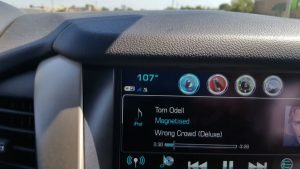 The cold front fired first and it was tempting to head north but we held our ground and with temps of 100f reached with 70f dewpoints it was sweltering in a hot hairdryer surface wind. The first storms went up just South West of Grand Island and the chase was on, we positioned ourselves just east of the NNE moving Supercells and watched lightning and some interesting non rotating wall clouds, the hope today was the 2nd,3rd and so on storms would move into the rain cooled air of the previous storms and hopfeully have better synoptics to work with. 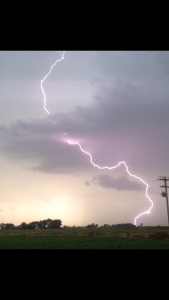 The structure at times was very nice with some stunning Cg bolts. Picture below courtesy of John Finney. But the storms were starting to go rapidly HP Outflow dominant with winds of 75-80mph being recorded. 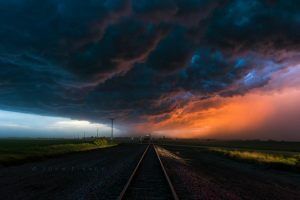 As we raced to keep ahead of the storms around sunset the shelf started to look amazing due to the setting sun and all that dirt and dust it turned the storm a dirty orange colour. 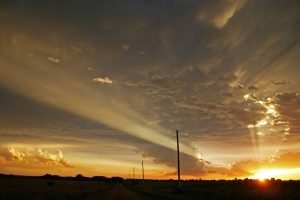 Not a bad bonus chase day and we ended the day in Lincoln (Nebraska) Picture below from John Finney at Sunset! After a few down days this day had me really excited from a few days out, this I believe was the chase day of the 2017 season so it was important to get this one right. 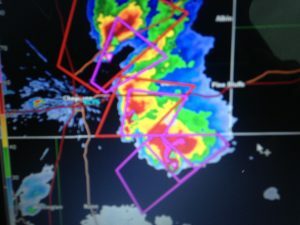 I positioned us overnight in Cheyenne as that is where I was expecting the biggest concentration of severe the next day. Overnight model runs from the HRRR painted an exciting picture from the chasers point of view not so much for the population that lived around here. 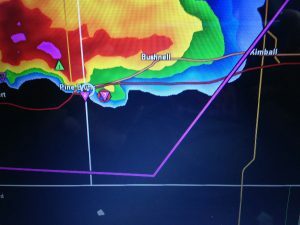 Run Below showing a string of pearls tornadic supercells. Upon awaking the next morning I could not believe what I was seeing, a Moderate Risk and a 15% Hatched tornado chances for Wyoming, this is the first time ever Wyoming has had anything over a 10% Hatched and an extremely rare set-up! Most of the big risks for 2017 had gone down the pooper so I was still cautious even during the morning of the chase day. The set up was very volatile, surface dewpoints of low 60’s and with our elevation at 6,000ft asl this was as good as 75-80f in lower elevations like Oklahoma, surface temperature of the mid seventies was also perfect, LCL’s around 400metres, 45knts of shear and a lifting warm front, nirvana conditions! The morning was foggy and once that burned off fast moving cumulus ripped northwards getting torn apart by the shear, this certainly looked like a tornado day! The one thing I was cautious about was a strong cap in NE Colorado with temps of 16-18c would storms be able to sustain themselves before being killed by the cap, so thinking was to go a little bit further north away from the cap and we headed for Chugwater along with quite a bit of convergence! A special balloon sounding was performed around 1pm which we watched! Just after this at about 2pm the first Wyoming storm started to get organised SW of Chugwater but this was moving straight north along the mountains to our west, this area of Wyoming is like tornado central for supercells that turn right so I was hopeful we could get an early tornado under our belts and enjoy the rest of the day. We headed west just north of Chugwater and got our first look at the storm and it looked very HP in nature, not good when 4″ hail was being forecasted! About this time also a PDS Tornado Watch was issued, incredible never seen before this far west in the history of the national weather service! The Supercell turned right as expected but I was still not feeling it and 3 Supercells had by now initiated along the front range in Colorado around the Fort Collins area and 1 just SW of Cheyenne. The decision was made to bomb back south about 50 miles and get a look at these by now tornadic storms. The cap was not killing them as the models said and they were starting to move into some incredible synoptic conditions. 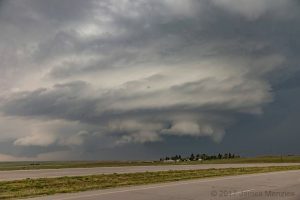 We got a first look at the top supercell near Cheyenne and it was a nice LP transitioning into Classic, we stopped east of Cheyenne and watched a weakly rotating wall cloud for a while always keeping a check on the 2 Supercells to our south that looked perfect on radar. 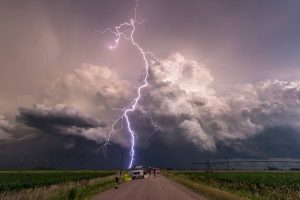 The next big decision was made around this time to concentrate on the bottom 2 supercells which looked amazing and we dropped further south to the town of Carpenter to watch, we were now surrounded by 3 Tornadic Supercells – what a sight! 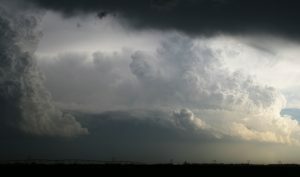 The picture above is of the Middle Supercell and I made the only wrong move of the day by moving north with this storm at this time as it was rotating hard and putting down funnels, the storm to the south which would become the Cyclic Supercell of the day/year was still looking like it had lots to do to become organised. So north we went by about 10 miles up towards the I80. 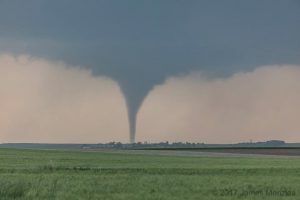 Around this time the Southern Supercell went nuts and dropped a stunning white cone tornado right over Carpenter where we were sat 20 minutes before (Thats Chasing) and to show how close we still were, we still managed to watch it when it was quite strong and a stunning rope out. A quick look at this storm I knew this was the one to be on today, a real cyclic beast of a storm that had 3 Mesocyclones and 3 hooks at times. I punched back through west of Pine Bluff to get South East of the storm taking a few golfball sized hailstones. 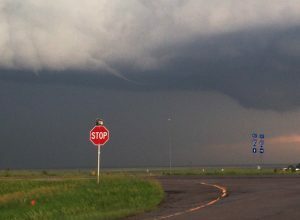 When we emerged it was a funnel fest with lots of Mid level funnels and shear funnels, the storm was cycling at this stage and was about to go into tornado rampage mode as it crossed into the Nebraska Panhandle. We continued east to Kimball and then had a great north road to be just south of the Supercell, about this time the structure was stunning and reminded me of the Westpoint (NE) storm from 2014! 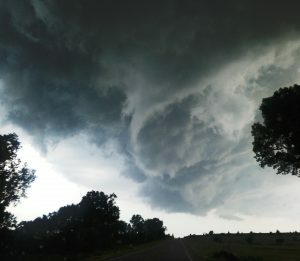 But the added bonus this time was it had a tornado dangling underneath the middle mesocyclone! Tornado number 2 in the bag for today! 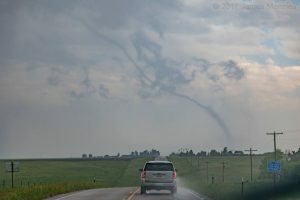 We continued north with the storm and stopped after a few miles as Tornado number 3 occured from the furthest west Meso this time. 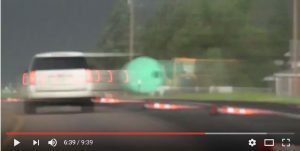 Just after tornado number 5 we went really close into the RFD area and nearly got side swiped by a 2000lb barrel that was getting blown east at a rapid speed. My white chase car below! All in all I am pleased how today turned out with 6 Tornadoes on a tricky day, we could have stayed north but maybe some luck in having to stay close to Denver paid off today, there were tornadoes further north but they were harder to see over some tricky chase terrain up towards the Black Hills area. Some maps and reports below for the day!